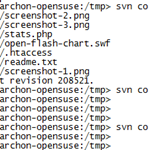 I've encountered a problem recently where I had to figure out if some checked out code is up-to-date with the svn repository, without actually running svn update. Unfortunately, svn update doesn't have a dry-run option, so I had to find another solution. I came up with 2, depending on how detailed the information needs to be, which I'm about to share in this post. If any files need updating, you will see a * before the file name.